Under the current system, individuals and families may knock on different “doors” for health insurance coverage, many of which may not open, preventing them from getting covered. But what if, during the implementation of the Affordable Care Act, every door was the right door to get enrolled in health coverage? 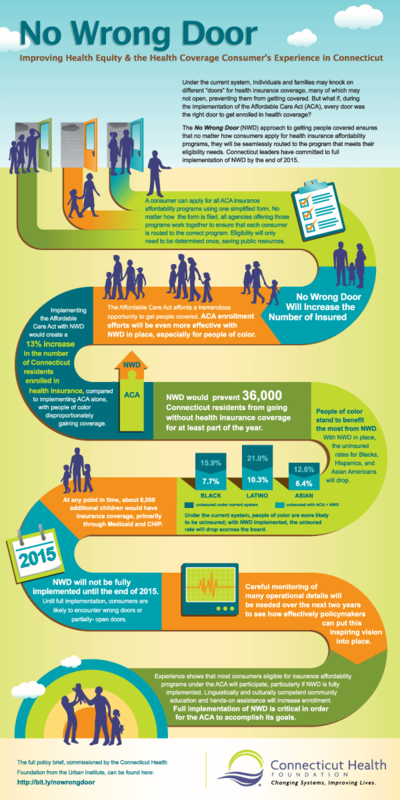 The “No Wrong Door” approach to health insurance enrollment would prevent 36,000 Connecticut residents from going without health insurance coverage for at least part of one year. People of color stand to benefit the most from NWD. With NWD in place, the uninsured rates for Blacks, Hispanics, and Asian Americans will drop.